Polo shirt is now considered as a classic. Going down to history, polo shirts are known to be used by polo players but today’ it become a universal trend, polo shirts was once referred only to the long-sleeved, buttoned-down shirts traditionally used in polo, soon became a universal name on shirts. The U.S. Polo Assn. brand is the official brand of the United States Polo Association, it offers trendy, displaying stylish solid and striped color varieties that allow you to make your own bold fashion statement. Each polo shirt is suited for multi-purposes and comprised of high-quality 100% cotton. 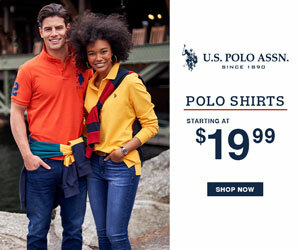 While their primary products are clothing for men, women and chilsdren, U.S. POLO ASSN. brand also offers accessories, luggage, watches, shoes and even home furnishings. This brand is not new to us since we have been buying it for ages because of its high quality and affordable price. But what interest me is their sneakers which i personally believe can compete to well know brands in the market today. The materials and the design is such a beauty and what’s matters most is that it’s comfortable to wear. There are many fashion sneakers that can make a statement and some brand which was created as best in athletic and or fashion-focused footwear focused but US Polo Assn sneakers are not trendy but still remains with the classic feel vibes that i am looking for which is good for just any wear. It’s worth buying and a must have in every girls closet. You can check out their different styles for men, women and children alike. Shop Bestsellers at U.S. Polo Assn. There wide selection is eligible for free shipping and free returns. Want To Look Your Best? Here’s How! FOR MORE INFORMATION, OR IF YOU ARE INTERESTED IN FITNESS FASHION & FREEBIES REVIEWING YOUR PRODUCT OR BUSINESS, FEEL FREE TO DIRECT ALL INQUIRIES AND PROPOSAL TO MELANDRIAONLINE(AT)GMAIL.COM WITH THE WORD "ADVERTISING" IN THE SUBJECT.